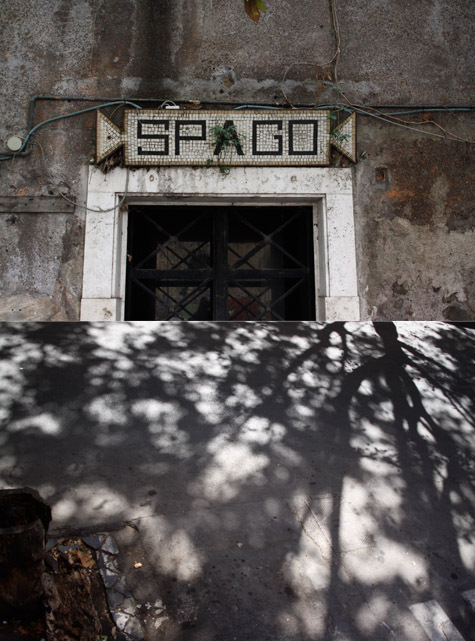 The last time I was in Rome, Wayne and I kept finding ourselves in the Testaccio neighborhood. It's across the river and a bit more of a walk to the historical center when compared to Trastevere, but it's the real deal. 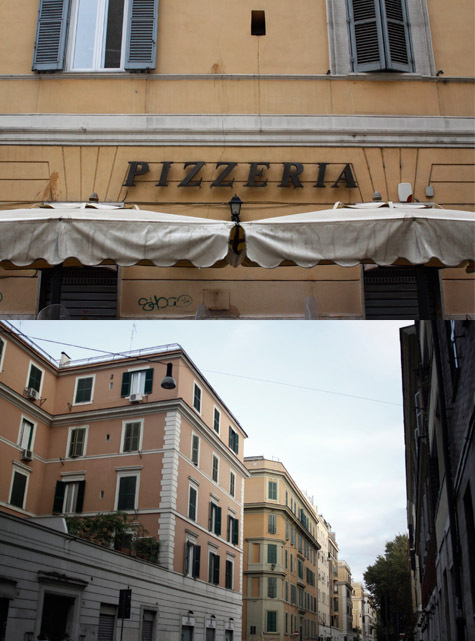 Anyone who has been here knows, it's a challenge to find a corner of Rome that isn't jam-packed with tourists. But Testaccio is one of them. The bustling market frequented by the locals functions as the hub of the area, and there is a bakery, espresso stop, and pizzeria on just about every block. 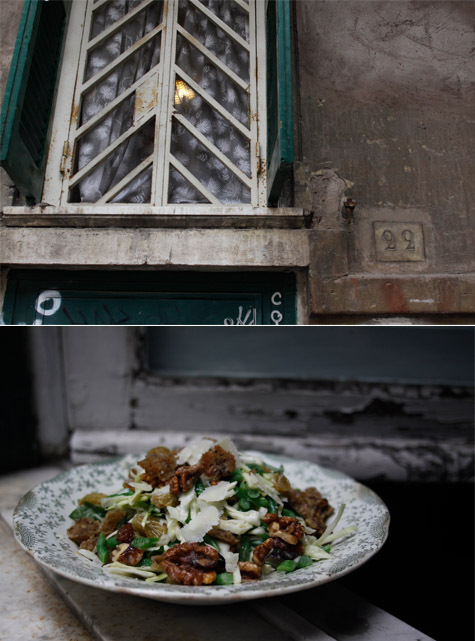 We rented an apartment here for a few weeks, and I thought I'd share some photos along with a recipe for a nut-studded, slaw-like green bean salad I made for lunch yesterday from a few things I picked up in the nearby shops and stalls. I've been primarily shooting with film, but I brought a digital camera as well. Mainly to take a few snapshots to share with you while I'm here. I took the camera out for a short walk early this morning. It's the time of day when things are just coming to life - cars beginning to retake the streets, kids waiting in front of schools, city workers sugaring espressos at cafe counters, bakery ovens going full tilt. 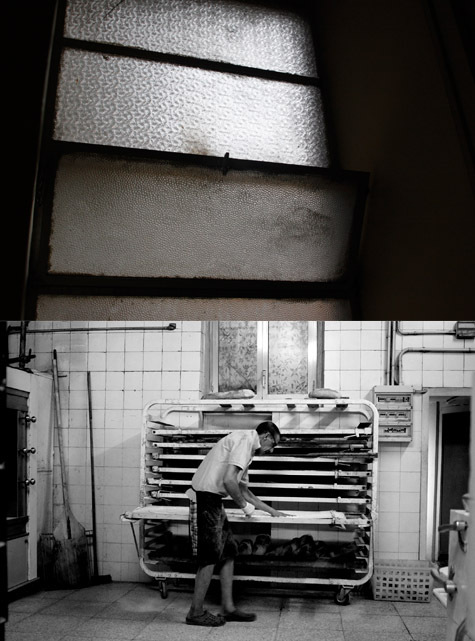 Below our apartment there is one that specializes in long, thin slabs of pizza al taglio. Lots of different kinds - biancho, tomato, zucchini, etc. Olive oil soaked and so tasty. As far as photography goes, the light and textures here are completely different than anything I see in San Francisco. It's part of what I love about traveling - whether it's to Rome or Paris or Kyoto - or even Napa, which is right in my backyard. Every place has its own distinct light, and part of what is interesting about a new place is getting to know it. Or at least attempting to get to know it. Weather changes it, also the time of year, buildings, pollution, and on and on. There are times when the light here seems almost pink to me, particularly in the early mornings. Beyond Testaccio, I've been drinking caffe macchiati, eating cacio e pepi, and people watching from marble steps all over the city. We must be walking fifteen miles a day, and thank god it isn't any hotter. The weather has been quite mild which is helpful because I've been trying to explore a few of the more offbeat neighborhoods. Sometimes this involves a subway ride, a sweaty bus ride, a long walk - (or, often) all of the above. I don't remember which one of us instated the "no taxi" stipulation when we explore cities, but that's become the rule - public transportation or on foot. Anyways, Pigneto was cool, funky, and fun and I look forward to going back there once or twice more before I leave. Same with San Lorenzo. 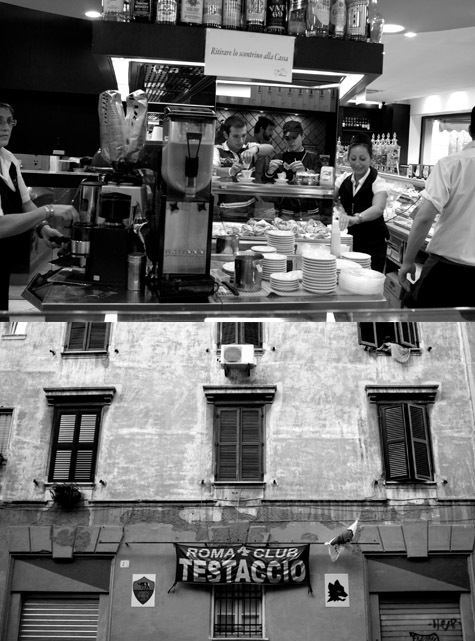 For those of you who have been to Testaccio, it's amazing on the food front. Volpetti is around the corner - my supply for (in addition to a host of other things) sheep's milk ricotta and the most intense, luxe Greek yogurt ever. There is a shop dedicated to spices a block away, and another for fresh egg pasta. Sitting in the shaded park across the street from 00100 with a slice and a beer is really hard to beat. And the nice elderly lady I bought eggs from the last time I stayed in Rome is still selling in the corner of the Testaccio market, the yolks of her eggs just as orange as I remember. A few notes about the salad. It is a mish-mash of ingredients to be sure. But somehow I think they work together. In addition to the green beans you have an arugula and shredded cabbage base punctuated with golden raisins plumped with sweet moscato wine. Beyond that, I tossed in some toasted walnuts, croutons, and shaved pecorino cheese. You get sweetness and saltiness from the raisins and cheese, and crunch from the nuts, croutons, and cabbage playing off the creaminess of the dressing. It's substantial enough to make a meal of, but not too heavy. It was quite hot the day I made it, and it made just the right lunch along with a couple other antipasti. I used a moscato from Trani, Italy here, but feel free to experiment with other sweet white wines. The one I used was about 14% alcohol - just the right amount of boozy for a salad like this. As far as advanced prep goes - you can make the dressing a day or two ahead of time if you like. And you can slice the green beans, and make the croutons a day ahead of time as well. I used a wood-fired oven spelt walnut bread for the croutons here, but use whatever good bread you have on hand. 2 big handfuls green beans or haricot verts, very thinly sliced and cooked in a pot of boiling salted water for 20 seconds, drained (well) immediately, and cooled under cold running water. Place the raisins in a small bowl and cover with the wine. Let soak overnight, or for at least a few hours. To make the dressing, mash the yolk of the egg in a small bowl. Gradually mash and stir in the creme fraiche. Very slowly add the olive oil beating constantly. It should be smooth and glossy. Whisk in the vinegar and lastly the salt. Taste and adjust if needed. When you're close to being ready to serve the salad, toss the cabbage and the vinegar together in a large bowl and let sit for 10 minutes. Just before serving, drain the raisins and add to the cabbage. Add the green beans, arugula, and most of the walnuts. Toss a few times. Add about 2/3 of the dressing and toss gently, but well. Taste and add more dressing if you like. Add most of the croutons and most of the pecorino cheese, before tossing again. Serve topped with the remaining walnuts and pecorino.